Midori's mother has finally acquired her dream home, but it isn't long before supernatural phenomena disrupt the peace of the family. And if unexplained electricity failures, strange phone calls, and the eerie presence of spirits weren't enough, finding unexplainable blood in the bathroom becomes the last straw. Mai and Shibuya Psychic Research are brought in to investigate, but what horrors will they find in the 'dream' home that turns out to be nothing but a nightmare? 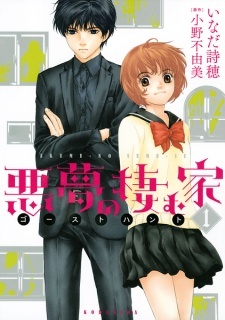 So this is the sequel to ‘Ghost Hunt’ and therefore has a pretty large spoiler from the manga. I sadly cannot skip talking about this spoiler because it is such a big piece to the story and the reason why one of the main characters is there. I will try to not give to much information though. If you have not read the first manga, please do so before reading this review. The story ‘mostly’ is about a man by the name of Seigi Hirota who is an investigator from the Tokyo’s Special Investigation team. As a man of science, he doesn’t believe in anything paranormal and believes ghost hunters, psychic researchers, and normal psychics to be con artists including those from SPR, run by Naru. Ever since the ending of the first manga, he has believed that Naru had killed someone instead of just finding them though psychic means. When his friend Agawa was having trouble with a house they were living in, he had the SPR team come in to take a look for the soul purpose of trying to find any way of getting a confession from Naru. I won’t lie; Seigi annoyed the hell out of me with just how close minded he was the whole manga. Here you have a ton of stuff happening, some of which he could not explain even with his science background and yet he would still call them con artists and that the whole thing was a sham. We have the same fun characters as we had in the main story; John Brown the Prist, Masako Hara the T.V. pychic, Haushou Takigawa the monk, Lin Koujo the Taoist, Ayako Matsuzaki the miko, and both Naru and Mai. None of them really seems to have changed from how they were when we last left them off although they do seem a little more like a family with just how close they have become. In some ways, that was a good thing but in others, I sort of feel sorry a bit for Ayako who almost always seems to be pushed to the side and in the supporting character role since she has a limited style of exorcism. When talking about the case they were doing, it actually felt a lot like the original cases from the first manga series. In fact, it felt as though it was originally intended to be in the main manga but then became just a continuation manga. I wouldn’t mind if she kept these continuation mangas going for a bit as she hasn’t lost her touch after the two years of not doing anything with the series. The art is very similar to the first although you can tell the small differences such as the style of hair and clothing. Mai looks a little more mature while a lot of the others kept their normal looks. The backgrounds were really high detailed and they did a very good job with figuring out how dark they could go without making you unable to tell what was going on or where they were. The manga left me wanting more just as the first had and yet it looks like Fuyumi may not be keeping the series going. I really hope she does as this series has always got my interest. Even if she does small case file mangas of the series like how this one seems to be, I would still try to read them as I love the characters personalities and how diverse the group is.